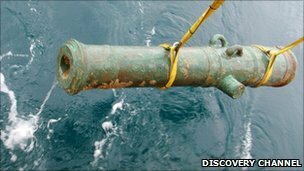 41 extremely rare bronze cannon have been discovered in the English Channel, according to an article on the BBC website. 2 have been brought to the surface, a 12 and a 42 pounder gun, to establish the identity of the wreck. An earlier HMS Victory to Lord Nelson's famous ship, it was earlier thought to have foundered on the rocks and went down, but it's discovery 100 km's away from the rocks suggest the addition of larger cannon may have made the ship top heavy and sank that way. A public consultation in going on in the UK over what to do with the wreck, cannon and more than 1000 remains of the sailors. There is also a documentary about the recovery on the Discovery Channel.